Giraffe turns its head to camera and walks away. 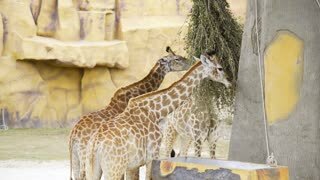 African animal's long neck covered by coat with dark patches and mane against green foliage on background. Patterned skin of exotic mammal in details. Close-up of giraffe's eye looking at camera. Highly detailed picture of african inhabitant's head and patterned skin. Staring exotic animal in details. Watch and observation concept. Side view. Close-up of giraffe's patterned skin covering its hip. Highly detailed picture of fur pattern and hide texture of african mammal. Сoat with dark patches. Body of beautiful exotic animal in details. Close-up of Asian elephants grey wrinkled, lined, thick hide illuminated by bright light. Skin texture of exotic mammal in details. Large wild animal breathing, slightly moving. Camera stays still.